Setup: Each player shuffles his starting hand into his deck. Each player prepares a separate captured deck (see insert). Each player adds 2 resources to his starting hero and sets his threat to that hero's threat cost. Set Southern Gate, Jailor Gornákh and the Angmar Orcs encounter set aside, out of play. Shuffle the encounter deck. Each player draws a new starting hand of 3 cards. When Revealed: Each player creates his own staging area and advances to a different stage 2A. When Revealed: Search the encounter deck for 1 copy of Prison Cell, reveal it, and add it to your staging area. Then capture an additional 2 cards from the top of your captured deck underneath that copy of Prison Cell. Any time players would place progress on this quest, resuce an equal number of captured cards at random from underneath it instead. (Progress is placed on the active location before triggering this effect.) 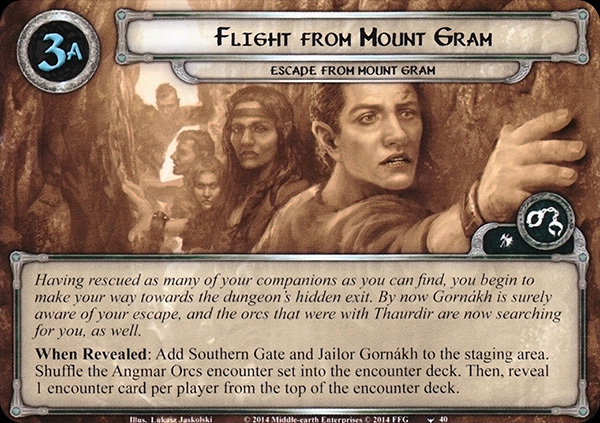 Forced: If there are no captured cards underneath Gornákh's Dungeons, join another player at the beginning of the travel phase. If you cannot join another player, all players advance to stage 3A together. When Revealed: Add Southern Gate and Jailor Gornakh to the staging area. Shuffle the Angmar Orcs encounter set into the encounter deck. Then, reveal 1 encounter card per player from the top of the encounter deck. The player cannot travel to Southern Gate unless there is at least 16 progress on this stage. The players cannot defeat this stage while Souther Gate is in play. If the players defeat this stage, they have escaped Mount Gram and win the game. 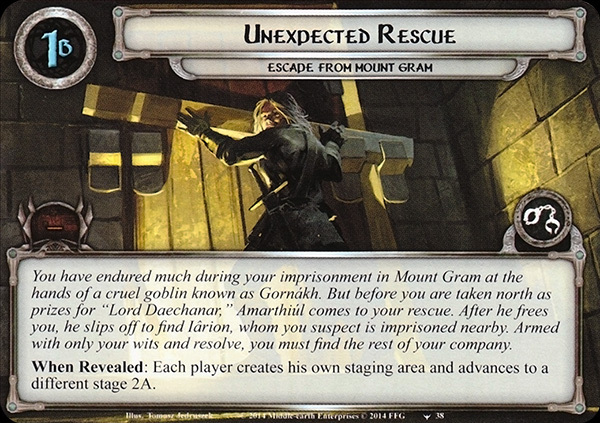 Forced: After 1 or more captured cards are rescued, Jailor Gornákh engages the player with the highest threat and makes an immediate attack. Immune to player card effects. White Southern Gate s the active location, each Orc enemy gets +2 Attack. Forced: When Southern Gate becomes the active location, each player with less than 35 threat must raise his threat to 35. Forced: When Cruel Torturer would damage an ally by an attack, capture that ally underneath Cruel Torturer instead. 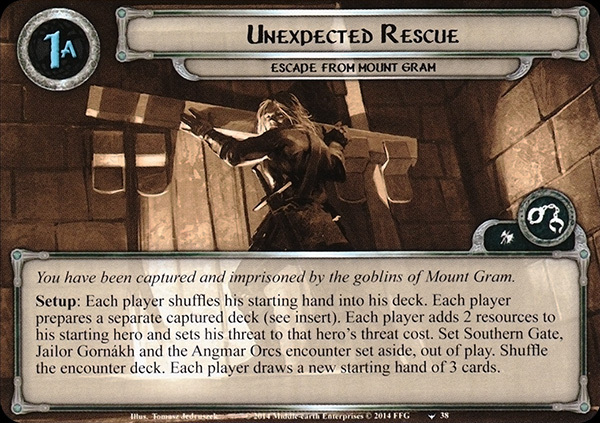 Response: After the captured card(s) underneath Dungeon Guard are rescued, the players may put 1 of them into play at no cost. X is the number of cards in play with 1 or more captured cards underneath them. Shadow: Attacking enemy gets +1 Attack (+2 Attack instead if it has no captured cards underneath it). Response: After the players travel to Prison Cell, look at the captured card(s) underneath it and choose 1 to put into play at no cost. Place the other cards back underneath Prison Cell. Travel: Each player raises his threat by 3 to travel here. Shadow: Attacking enemy gets +1 Attack (+2 Attack instead if the defending player's threat is 20 or higher). X is the number of captured cards underneath Tunnels of Mount Gram. Shadow: Capture each attachment attached to the defending character underneath the attacking enemy. When Revealed: Until the end of the round, each enemy gets -10 engagement cost and +1 Attack. If there are no enemies in play, search the encounter deck and discard pile for an enemy and add it to the staging area. When Revealed: Each player must either deal 1 damage to each exhausted character he controls, or remove each exhausted character he controls from the quest. Shadow: Exhaust a character you control. When Revealed: Each player chooses one of his allies and captures it underneath the encounter card with the highest Threat. Shadow: If this attack would damage an ally, capture that ally underneath the attacking enemy instead. When Revealed: Each player discards the top card of his captured deck and raises his threat by that card's printed resource cost. If at least 1 player discarded no cards from this effect, Interrogation gains Doomed 2. Shadow: Discard a random card from your hand and raise your threat by its printed cost. Forced: When the last time counter is removed from this quest, discard its captured cards and remove this quest from the game. Then, raise each player's threat by 3 for each of his characters that was discarded by this effect.